I am excited about Daniela Sacerdoti's first YA book which is published next week. If you may remember, Dani wrote Watch Over Me which was one the book I loved the most in January. Here is my review for you to see. As part of the blog tour for Dreams, Dani was happy to reveal a few secrets about the main character Sarah. So, here’s some help to unravel Sarah’s secrets. Some of them will be revealed in the course of the three books, some will be just for you to know. 1) Sarah’s birthday is the 22nd of October. She’s on the cusp between a Libra and a Scorpio (Scorpio starts the 23rd of October). Her rising sign is Sagittarius. 2) She has Chinese ancestors – her great-great grandfather, Dembric Midnight, from Islay in the Hebrides, married a girl from Jilin province, called Lei Gua. 3) Her biggest passion is playing the cello. She’s an accomplished musician and she hopes to gain a place in the Royal Conservatoire of Scotland. 4) Sarah’s favourite book is Wuthering Heights, by Emily Bronte, and her favourite poetry is by the Latin poet Catullus. 5) She has a tiny birth mark on her collarbone, just below her right shoulder, shaped like a little swallow. 6) Sarah’s favourite drink is Hazelnut Hot Chocolate from Starbucks. 7) Sarah is obsessed with her waist-long hair, which she keeps shiny with almond oil masks. Her fragrance of choice is Pivoine Flora, by l’Occitane. 8) She loves fairy-tales, especially dark, gory ones, and Scandinavian thrillers. 9) Her first kiss was a very chaste peek on the cheek, in Primary 3. Culprit: Jake Mallach, who, to this day, fancies her desperately. 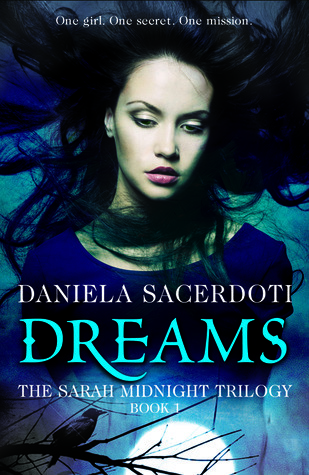 For your chance to win one of two copies of Dreams by Daniela Sacerdoti, please enter your details in the Rafflecopter below. This is a UK competition only. The closing date is Monday 14th May. This is a lovely post! I don't have a birthmark but I do have a 'tea-stain' in the shape of a butterfly. Fun post! Hazelnut hot chocolate sounds divine. Usually I order coffee or tea, but I will keep this in mind as a treat!And I will tell my daughters about the almond oil secret for shinier hair.